Indian Summer CAL week 3 is out now for you to download on the Deramores website. In the third part of the pattern we’ll be working on the two strips we made last week. Picking up from where we left off, we’ll be adding more rows on one side of each strip, working onto the edge that doesn’t end in colour H.
We’ll be using a few Front Post / Front Raised stitches again to add some lovely texture and then we’ll be making ‘flowery arches’ – for want of a better description! The pattern is packed full of photos to help you along but if you find yourself a bit stumped just get in touch. Share your progress and get support on the Deramores: The Projects facebook page and if you are posting online don’t forget to use the hashtag #GoTeamIndianSummer so we can find your shots. We just love seeing your photos!!! You can also add your projects to Ravelry here – pattern on the Ravelry database. You can download from the digital pattern for free from Deramores in either UK or US crochet terms. Just add it to your basket, checkout and then you’ll be emailed the pattern. 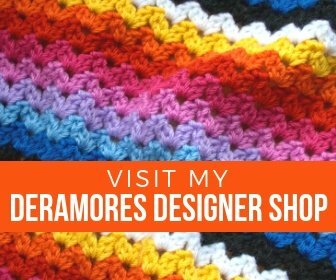 Depending on where you are you can grab the pattern from the British Deramores site, American Deramores site or Australian Deramores site. I hope you enjoy this weeks pattern! Next week we’ll be working the ripple section and adding to what we make this week. Rummage around for a larger hook for next week but for now, enjoy week 3! 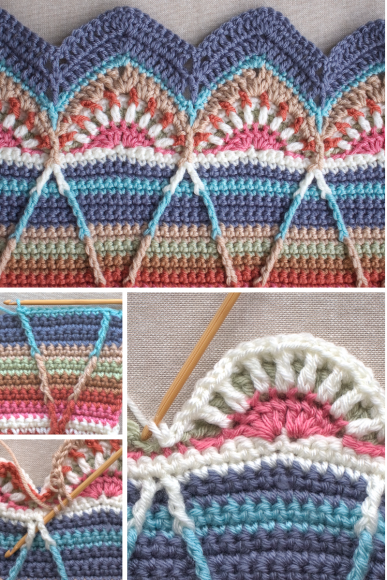 Indian Summer CAL Week 2 – Out Now!Indian Summer CAL Week 4 – Out Now!